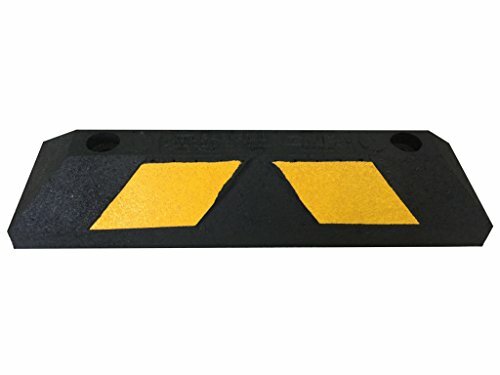 22 inches long x 6 in wide x 4 inch high rubber parking curb for garages, driveways or carports. They are lightweight only 10 lbs. and easy to transport & install in either rain or shine. No heavy equipment needed. The curbs are extremely flexible, since they are made from rubber and they conform to any uneven road surface, concrete or asphalt (black-top). They are highly visible too permanent in-molded reflective tape reflects light so that you can clearly see them day or night. The curbs are easily stored, removable or relocatable - so if you want to move them before plowing or just move them to a new location, just pick them up without any special equipment. They are resistant to ultraviolet light, moisture, oil and extreme temperatures. And they come with a three year money back guarantee. So buy with confidence today note: Installation hardware not included. If you have any questions about this product by TLCTrafficSafety, contact us by completing and submitting the form below. If you are looking for a specif part number, please include it with your message.